Interest (x%) may be added or subtracted to the variable interest rates indicated in the interest table created –Percentage to Add (Annual). This added (or subtracted) interest rate can take effect at any time during the calculation – Eff. Date. The simple interest may be capitalized (compounded) at the anniversary date – __ Capitalize. Choose any interest rate table among the many legal interest tables or create your very own. You can see the interest table dates and rates by pressing on the . In some jurisdictions, the interest rate to be used is the rate at the start of the proceedings. Margill can do this by checking . Can divide the Total Interest in a fixed rate portion and a variable rate (not shown in example). For example when the rate is 7%, 5% could be the legal (or contractual interest) and 2% an additional indemnity. When the rate is 9%, the additional indemnity would be 4%. Results can be exported to TXT format (Export button) or Word, Excel, XML (Web) (right click of the mouse). Results may be printed in a concise report. Simply check the box to use the rate at the Start Date. In this example, the rate on 05-05-1998 is 5%, thus the whole calculation will use 5% even if rates change afterwards. 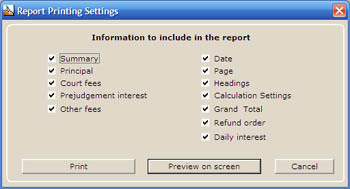 The Results screen will be like that above at a unique fixed interest rate of 8% in this example. 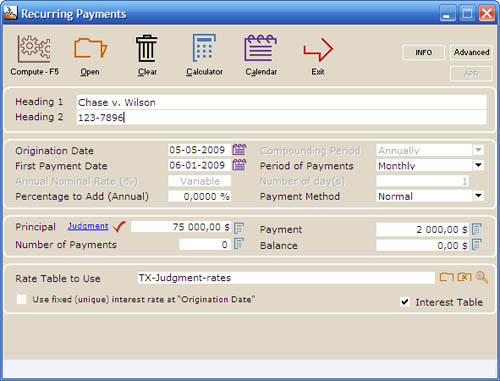 This highly sophisticated module offers a unique tool to easily collect judgment awards when prejudgment interest is already computed and/or court fees included in the amount due to the plaintiff. Calculations can be done using simple or compound interest. Include $6,000 court fees and $5,000 prejudgment interest (no interest on these). This is easily entered with theJudgment link above. Interest can also be added on these amounts. Court fees can be added at the Origination date or later on, at any time in the resulting schedule. Starting 03/01/2010, we decide to recompute the equal payments to repay the total amount owed in 38 months. Margill can include just about any repayment scenario however complex! The reports include the summary schedule as well as separate sections for Principal, Court fees, Prejudgment interest and Other fees. $50,000 judgment in which the defendant has made 3 payments before the judgment. What is the total interest due at the judgment date? 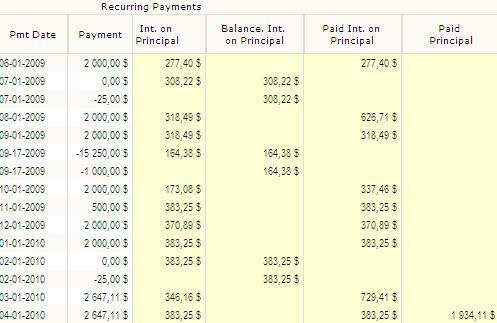 Use the Recurring payments (Amortization) calculation and Irregular payments. You will then be able to build your schedule. Simple or compound interest could be used. In this example, simple interest is used (Advanced icon). Three payments before judgment: January 10, 1999, June 26, 2000 and November 11, 2003. The judgment is pronounced on October 15, 2004. 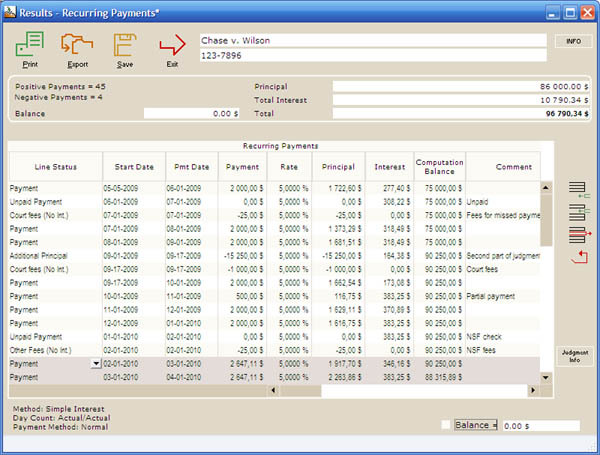 You must add each payment in the table (initially empty – “Period of Payments” being “Irregular”) to calculate the balance due and interest in the Results screen. The judge may also decide to award various amounts at certain moments in time. In this case, insert negative amounts in the “Payment” column. 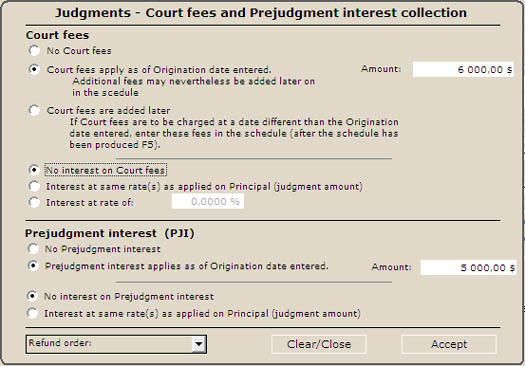 In the example below, we will see how to calculate the interest if the defendant (now debtor) agrees to pay what is owed at $6000 per month. The defendant owes the plaintiff $68,782.18 on the day of the judgment. 1) Continue the above calculation (nice and neat to have all in one calculation). In this case, since we are using simple interest, we must (may) add the accumulated interest on the judgment date. In our example, the debtor pays $6000 on the first of each month. These amounts, the payment frequencies and the interest rates can be changed. Also, if payments are missed, these can be added to the schedule and the table is recalculated. 2) Make new payment schedule using $68,782.18 on the day of the judgment in the Recurring Payments (Amortization) calculation. The schedule can also be saved and edited. Use the “Accrual by installment calculation”. See the Late / unpaid Salaries, Rent, Alimony page. The plaintiff (20 years old) was seriously injured as a student in university. He will not be able to work for the rest of his life. What lump sum should be paid today instead of a structured settlement, taking into account his revenue today as a student, as a worker and upon retirement? In this screen we have $1000 for 2 years (these were changed manually in the Present Value table – 24 changes). As we scroll down the Present Value table, we see the monthly installments change to reflect our hypotheses above. With a 3% discount rate (the discount rate may be fixed by law), the plaintiff should receive $1.53 million. With a 2% discount rate, the amount would be $1.88 million. What is the value TODAY of a 1983 judgment of $125 000?